Mr Poroshenko spoke alone to thousands of people in the capital Kiev's Olympic Stadium. 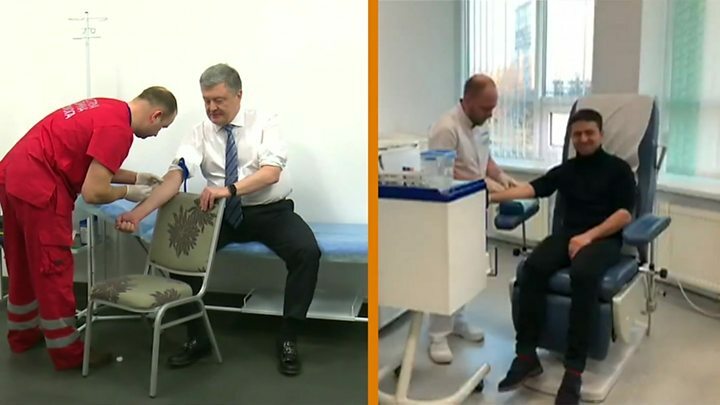 Mr Poroshenko, who is trailing his rival after winning just 16% of the first round vote, appears to now be hoping to capitalise on Mr Zelensky's failure to arrive at Kiev's Olympiyskiy Stadium for the televised face-off. According to the BBC's Kiev correspondent Jonah Fisher, the former businessman had wanted the debate to expose the fact his opponent - who has no political experience - had never really articulated a political vision or had his ideas subject to scrutiny. But instead the incumbent used his 45-minute wait at the podium to answer journalists' questions, and attack his absent rival. 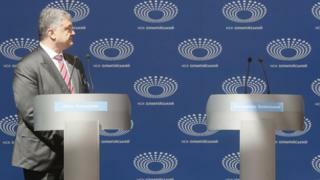 Mr Poroshenko, who critics say has not done enough to fight issues like corruption in the Eastern European nation, dubbed the election campaign a "silent movie", and accused Mr Zelensky of being afraid. "If he hides from people again, if he is afraid, we will invite him again. We will invite him every day to every live show for the whole country to see who it is going to elect for the next five years," he told the crowds and television cameras on his arrival. Mr Zelenksy has so far ignored the usual rules around campaigning, staging no rallies and giving few interviews - preferring to communicate via social media. Despite this, he finished the first round comfortably in the lead, garnering more than 30% of the vote, and is still favourite to win next weekend's ballot.